A very interesting moon shining in the east on yet another bitter cold morning. 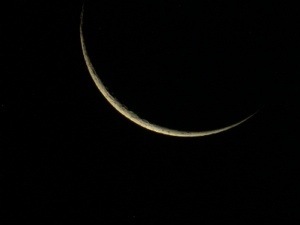 It’s just a sliver or as one of my kids said once when they were younger “the moon looks like a clipped toe nail”. If you were to have just been dropped on this planet and had never seen the moon in all its fullness, in all its cycles before, you would be looking at it right now and believe that’s all there is to it. Theres nothing more, just this little sliver of light. Life is the full moon. It’s easy to feel abundant and in sinc when “everything” is right there shining in your face. But what about when when the moon is in this phase. Look really closely as you observe the sliver of the moon. With not your common sense, rational part of your thinking, or even your eyes, just look at the moon and be drawn to observe the fullness of it that lurks in the shadow. Can you see it? Ah yes, I knew you could.